So I'm the owner of a startup which is going to make our lives easier with custom-DNA creatures! Our few first products are selling very well and nothing was wrong until last week's events. Another company has bought one of our products and just decoded the entire DNA sequence, then changed a few things and resold them as their own, consuming our income. It's pretty bad for us, but still ok, because we are able to sue them. Now imagine if some terrorists stole our viruses (nothing illegal, we use them for therapy) and changed (well-developed, readable) code to do some really bad things (like just killing for a start - or even worse). So our plan is to set up some sort of encryption! But it seems hard to do. Is there any easy way to set up encryption, or at least make DNA way less readable? White Hat: Biology is largely solved. DNA is the source code for our bodies. Now that gene sequencing is easy, we just have to read it. Megan: It's not just "source code". There's a ton of feedback and external processing. Megan: But even if it were, DNA is the result of the most aggressive optimization process in the universe, running in parallel at every level, in every living thing, for four billion years. White Hat: It's still just code. Megan: OK, try opening google.com and clicking "View Source." White Hat: OK,I-...Oh my god. Megan: That's just a few years of optimization by Google devs. DNA is thousands of times longer and way, way worse. White Hat: Wow, biology is impossible. What does this mean, specifically to your question? DNA that codes protein has to be in specific order. There are no two ways to code one protein, not really. DNA is already so complicated, interlinked, illogical, its results dependent on effects of totally other parts of DNA, et cetera (see Non-coding DNA article if you are interested), that all complications you can add on purpose will be very, very insignificant in comparison to what nature already did. Thus, if someone can crack what nature did, your additional layer of obfuscation wouldn't really change anything. 2a. Even for viruses - if someone wants to modify and use them on humans effectively, he must be able to decode and understand human genome - virus would be easy for someone with such capabilities, with the very, very limited space you have inside a virus. A normal organism arises from a single cell. Barring somatic mutation, each cell in the creature carries the same genetic code. Your competitor can swipe a hair and decode the genome from it. 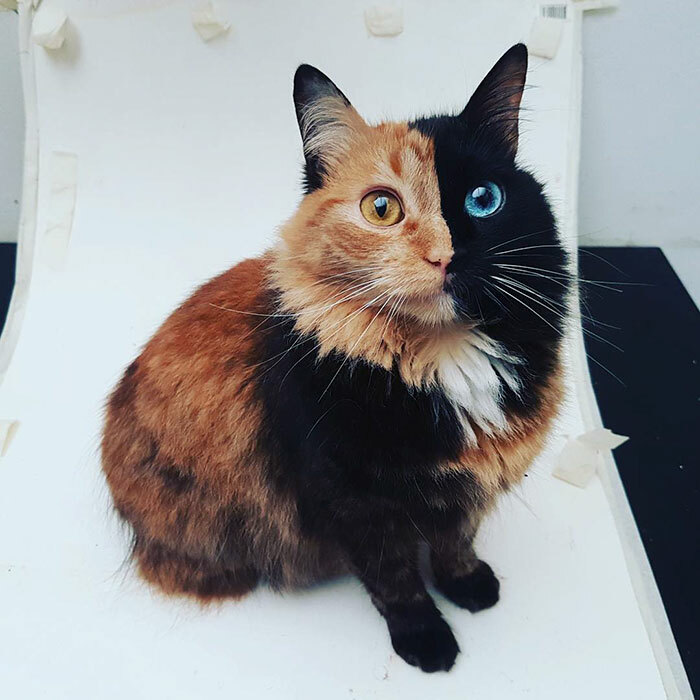 Chimeras like this cat can occur naturally. Two eggs fuse early on and the resulting creature is a balanced mix of 2 genomes. The genome decoded from one hair might not be the same as that decoded from another. You take it a step further. Your custom creatures are all chimeras, not of two but of many, many different engineered "eggs". Most of these cell lines have genomes which are purposefully defective and a creature arising only from one of these defective genomes would be a freak or nonviable. But together in your chimera, the mutant genes of some cells are compensated by strength (or just normalcy) of the adjacent cells. The mix of cells used to construct your chimera is not random - for example one might have a high population of a given mutant type in the liver, where their excess protein product can rescue the remainder of the organism which is deficient in that product. You would not know that if you just sequenced the genome from a stolen hair. Your competitor would need to sequence many, many cells from the whole organism, deduce what parts are bad (or are they bad?) and what parts are good, and hope to recreate the many lineages used and combine them in the right proportion to replicate the creature. Genetic engineering animals is old hat - you can buy glowy engineered fish at Petsmart. But creating a chimera from engineered lines is taking creature creation to a whole new SF level. You don't need to encrypt the DNA sequence in order for other people to be unable to use it. A DNA molecule has no intrinsic meaning, meaning that while you might be able to discern patterns, you will never get all of the information of an organism purely by looking at its DNA. Let me explain this with an analogy to language. If I gave you a book in a language you don't read, you would be incapable of understanding it. You know it's a book, and you know that it has meaning, but you can't reverse engineer it without testing things. For example taking a sentence and repeating it to someone who does speak that language, or re-arranging words and testing if they have the desired effect when you speak them to someone who understands them. A code, in this case the genetic code, requires a decoding system in order to contain meaningful information. In biology, the decoder is constituted of many other parts of the cell, including but not limited to the transcriptional machinery which transcribes the DNA to RNA, the translational machinery which translates the RNA to proteins, the epigenetic machinery which controls which regions should be transcribed, cell signalling pathways which modulate the previous systems based on external and internal factors, and so on. So it all comes back to the egg cell. It's not just a DNA molecule on its own. It's a DNA molecule in a very specific cellular context, and in the case of metazoans it's also a cell in a very specific organ context. A human egg cell can't develop in your bladder. It has certain requirements which are (typically) met by the uterus. If your creatures have sexual reproduction, you can engineer a breeder strain of the creature which gives birth to sterile progeny. To avoid the possibility of in-vitro fertilisation you can engineer them to give birth to a progeny lacking the equivalent of a uterus, or you can systematically perform hysterectomies before selling them. Change the start and stop codons by modifying the transcriptional machinery to recognize different patterns. You'll also need to alter the transcription start site sequence. Scramble the genetic code by making the various tRNAs correspond to different amino acids, which will force would-be thieves to conduct experiments in order to figure out what your proprietary version of the genetic code corresponds to. If you're using pre-existing transcription factors, perform directed mutagenesis experiments to make them recognize different sequence motifs. You should include many very long stretches of repeated regions in its DNA, as well as transposons. These make it much more difficult to assemble an organism's full genome. We're starting to be capable of tackling that problem with the third generation of sequencing methods which generates long reads that can resolve these repetitive sequences. Add many pseudogenes to confuse interpretation, these are DNA sequences that look like genes and are recognized by automated tools but aren't functional as such. Systematically scramble the genomes, in some single-celled organisms it has been shown that you can cut and randomly ligate large stretches of the genome without any major effects on fitness. If you don't mind each creature being uniquely sterile it might be possible to start with a freshly re-arranged egg cell without too many negative consequences for the creature's health. You probably do want to keep specific syntenic blocks together but if you define the acceptable regions to cut then it should be fine. Ultimately you want to make the cell different enough to ensure that in order to steal your creature, one would have to study it for so long that it's easier to just design their own original creature. Don't forget to make sure the creatures released to the public are incapable of reproducing. This is already a solved problem, but the solution is not encryption. The current solution is to have incomplete DNA. In particular, the DNA misses the code for an essential protein in development. That's no problem for you: you know which protein is missing, so you add that to the diet of the juvenile creatures. Once they leave your lab, there's no trace left of this mysterious protein or the DNA which encodes it. We use this technique today to release Genetically Modified organisms into the wild. As they cannot reproduce, unintended dispersal of the modified genes is also prevented. To add to what Mołot said: it's really not just code. The ribosome (/ˈraɪbəˌsoʊm, -boʊ-/]) is a complex molecular machine, found within all living cells, that serves as the site of biological protein synthesis (translation). 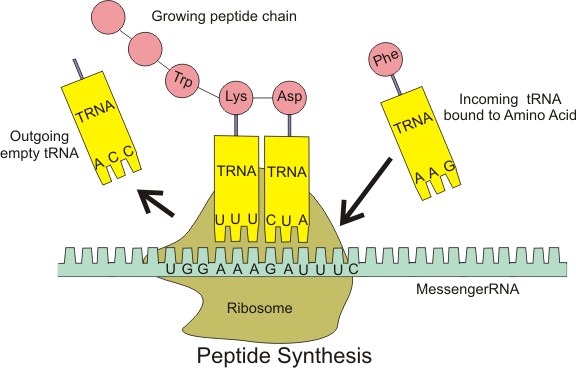 Ribosomes link amino acids together in the order specified by messenger RNA (mRNA) molecules. They know how to read RNA in a very specific way only. Every three bases that come in translate to a specific amino acid being linked on the output protein. If you just plainly "encrypt" an RNA sequence, ribosomes will read it without decryption. The output protein will be completely different from the original. On top of that, not all base trios encode for an amino acid. There is code for "end of protein" as well. Encrypted DNA would have those at very different places in the very least. Your encrypted DNA would be no different from "junk" DNA, which codes for nothing meaningful. Human DNA is already full of that. Use your own proprietary amino-acids. Bonus point: Everyone has to by your food for their creatures and the viruses can only grow in your vats, just watch who buys it. It will be harder to read sense into your genetic code, at least your oponent cannot just use normal DNA code analysis tools without thinking for himself. To make it even harder: Invent your own biological system. You might still want to use things like "proteins" and distinct molecules to transfer genetic code (something like RNA, DNA etc. ), but change the aminoacids, the nucleobases and as much other things as you want. Problems here: It's not easy and might not be edible and as long as the creature itself can reproduce and "live" everyone with enough money and time can analyse it. Killersolution: Don't give away reproductive systems. Put relevant reproductive information (with some proprietary specialities) on a special chromosome etc. on only one gender and never sell creatures with it (and don't let spies steal them). I've got a very... computer scientist's answer to that. A decade ago there was a programming contest that basically mimed the DNA – RNA – protein chain. You should produce not the source image, but the target image, the painting operations were basically the RNA instructions, constructing the protein. The contestants were expected to meddle with the "DNA". To make it harder and less straightforward, the actual "DNA" program encoding used in the task did around 20000 copying and subsetting operations on the more or less complete chunk of the DNA "text" before doing its actual job. People who were not quite diligent with implementation details had much less luck quickly executing this code. The big problem here is that the organism has to be able to decode its own DNA. Therefore the "decryption mechanism" has to be built-in in the organism. You can make it more obscure by hiding the important bits in lots of junk DNA. You can make decoding and encoding more difficult by using things like non-standard base pairs, and non-standard amino acids. Then the competitor can't just use off-the-shelf products to do their cloning with, they have to develop the same infrastructure from scratch your company uses to engineer them. But ultimately, you can't hide the genetic code from a well funded opponent, because the competitor can just reverse engineer what the organism does to read its own DNA. Every cell in your body already does this, you just might not have noticed. You didn't notice because you didn't grow an extra limb or eyeball, which might happen if it wasn't for this. You ask for encryption. Now one thing you can do with DNA is encypher it, which is kind of what Mołot's answer went towards. This is not as much encryption as merely obscuring the data. Everything you need to decode the data is present, it just might be difficult. If you want encryption, then what you want is a "key" such that anyone who knows this "key" can decode the data properly. Someone who doesn't have this "key" cannot. So I say every cell in our body does this, because they are differentiate. Every skin cell has "forgotten" how to become a liver cell. Every nerve cell has "forgotten" how to be a pancreas. If any one of them knew the magic key that would bring them back to being a "stem cell," then they could change their role in the body. But without that key, they remain differentiated. Now this may just be enciphering. We've made great strides in building keys that teach cells how to become stem cells. So it looks like the keys may have been there all along, but it's also possible that it just plain doesn't work that way and that the keys are permanently lost. There are some solid examples of permanently lost capabilities. Red blood cells shed their nucleus before moving out into the blood stream, so they truly lack the knowledge to be able to reproduce. So to truly encrypt the data, you need something that functions as a "key" which you can introduce during construction and remove afterwards. What you probably want is a protein structure which can do the decoding on RNA strands before they are used to assemble the proteins. In your "pure" strand which knows the key, this protein structure is encoded into the DNA, and gets built as the creature grows. At some point you introduce a virus with a "kill" signal. This signal triggers a mechanism in that structure which has a CRISPR like effect which excises the DNA "key" which can produce that structure. Proteins don't last forever. So after a short while, every copy of this decoder protein is gone, and because the code to generate them has been excised, no new proteins will be created. Now your creature no longer has access to those encrypted DNA strands. You'd probably keep a breeding stock that has never been exposed to the virus, so they keep producing new children with this capability. However, I recommend keeping the sequence in some safe somewhere, so that if a virus happens to hit your breeding stock, you haven't lost your keys. I feel like some of these answers don't quite cover the spectrum of plausibility. I agree that it's currently unfeasible to encrypt DNA only because they methods we have to read and write DNA also requires us to work in a framework of existing life. Because of this, @Thymine's answer isn't sensible since you would need to rewrite the entirety of how DNA actually operates (or, more basely, how proteins function) to make it an "unreadable language". However, DNA can be expanded. There are several labs that have created new "letters" of DNA. Floyd Romesberg's team added two new "letters" and have created entirely novel proteins. But they are still read and written using an expanded version of the existing known framework. Expanding the codons available, creating new mRNA and tRNA would certainly make things "unreadable" for a short time, but I would imagine you would need a novel approach to mRNA and tRNA and how they work on the new codons, and the new codons would need to perform the important functions, if you wanted it to remain unreadable without significant research. DNA is already encrypted. You just need to change the key. This code is entirely arbitrary. There’s no reason CGA must code for Arginine. It just does. To change this code all you need to do is replace the tRNA responsible for matching Arginine with CGA with your own that matches CGA to a different amino acid. If you replace every tRNA with your own version you’ve effectively “encrypted” the genome. You’ve completely changed the meaning of every DNA base in the genome. Someone who merely sequences the DNA of your organism will not be able to make any sense of it. Without knowing what the start codon or stop codons are you can’t even effectively distinguish real genes from the rest of the genome. They won’t be able to add any functioning genes to your organism until they decipher the new code. Importantly, it is currently much harder to work with RNA and proteins then it is for DNA so “decoding” the new tRNA code is not trivial. You can even take additional steps to make this more difficult. Hiding your tRNAs in repetitive sequences that make them difficult to sequence and including lots of “red herring” sequences that look like tRNAs but don’t quite work for various reasons, or even making more fundamental changes to the tRNA metabolism process so that you can’t predict the amino acid a given tRNA would carry based on its DNA sequence. The genome is large while the portion “encrypted” is quite small. Only about 1% of the genome will ever actually be translated into protein. Without knowing the tRNA code an attacker has no sure way of identifying where this portion is. Regions of the DNA aren’t simply labeled genes. This means a frequency analysis will be swamped by the rest of the genome that does not follow the same frequency distribution. Describing the encryption as monoalphabetic isn’t exactly correct. Because there are 64 different possible 3 base codons but only 21 amino-acids that need to be encoded. Therefore there are necessarily many alternative ways to encode each amino acid. This is somewhat analogous to homophonic substitution and will make frequency analysis even harder. Another difficulty the attacker will face is that each base can be interpreted in 3 different “frames”. Without knowing the start codon you don’t know the frame of the sequence so for any given sequence there are 3 possible interpretations of the sequence which are all equally valid without knowing the tRNA code. A final complication is the existence of RNA splicing. Eukaryotic genes contain sequences known as introns which are variable length interjections in the DNA sequence of the gene that will be removed from the RNA after it is produced. This means a gene isn’t a single contiguous block of message, it can be interspersed by dozens of variable length non-coding sequences. Additionally, these introns do not have to be a multiple of 3 in length so the frame is likely to shift after each intron. The size of the genome allows the creator to potentially include multiple fully functional gene sets into the genome which from any cryptographic appearance are indistinguishable from the genuine article, but to the organism are of course gibberish. So even if we allow, given all the above, that an attacker can identify potential tRNA codes there is still no way for them to know which of the 20 copies of every gene is actually the functioning set without further experimentation. With regards to known-plaintext attacks, that’s simply a matter of changing and obfuscating the genome to the extent that it is no longer recognizable. Now, I’m not trying to argue that this encryption is immune to decryption, but it certainly isn’t trivial. In my opinion, the easiest means of decryption will likely be biological experiments. Potentially sequencing the RNA and analyzing that since it will mostly contain exonic sequences will make decryption somewhat more tractable although you can combat this by producing many nonsense RNAs as well that sit around without even being translated. Another methodology would be to introduce various known sequences to the organism and then look for protein products that could correspond to the introduced sequence but this would be tedious and again there are various countermeasures that could be employed. Homomorphic encryption allows you to do arbitrary operations on encrypted data. You don’t need to decrypt it , you just need an encryption scheme that allows that. There are homomorphic compilers that can compile a source code that is already encrypted to prevent reverse engineering. You can take the same approach, encrypt your DNA, develop a Ribosome that can create proteins from the encrypted DNA and you are good to go. No one can read your DNA and modify it. Only thing is, homomorphic encryption is currently still being explored and there are no real world applications that use it regularly. It also slows down operations by a huge margin. It’s still a developing process. There could be a way. First of all, you will want to add much more proteins to the DNA to make it polluted, but should not mix with the sequence that your organism need. Genes that are not active are called recessive genes. You can have much bigger list of recessive genes, that would be impossible to detect the dominant. Putting genes from human limbs to a snail as a recessive genes will be a good step in that direction. Those recessive genes, will prevent any further development or copying the organism. Imagine this like added "salt" to the DNA, that will result in some instant deadly disease if modified. Splitting the DNA is still need in order the organism to grow, but the recessive genes will not mix with the dominant. Maybe you should also have a huge list of deadly disease that you will put randomly in your organism. Cloning would be possible tho. Not the answer you're looking for? Browse other questions tagged science-based biology genetics genetic-engineering or ask your own question. Will changing the DNA change the hair structure/color taking into account the fact that it gets constantly renewed? Is the DNA base of the currently living species able to change so much that supports the existence of “fairy tale” humans and animals?